The figure depicts adoption rates – whether an MP in Norway or Sweden had an account on Twitter or Facebook or not – during our time of data collection. The bars indicate the percentages as well as the “raw numbers” (in parenthesis) of MPs with accounts. While the fact that the Swedish parliament boasts more members than its Norwegian counterpart has influence on the numbers presented in the figure, the difference of scale is adjusted for when discussing these issues in terms of percentages. 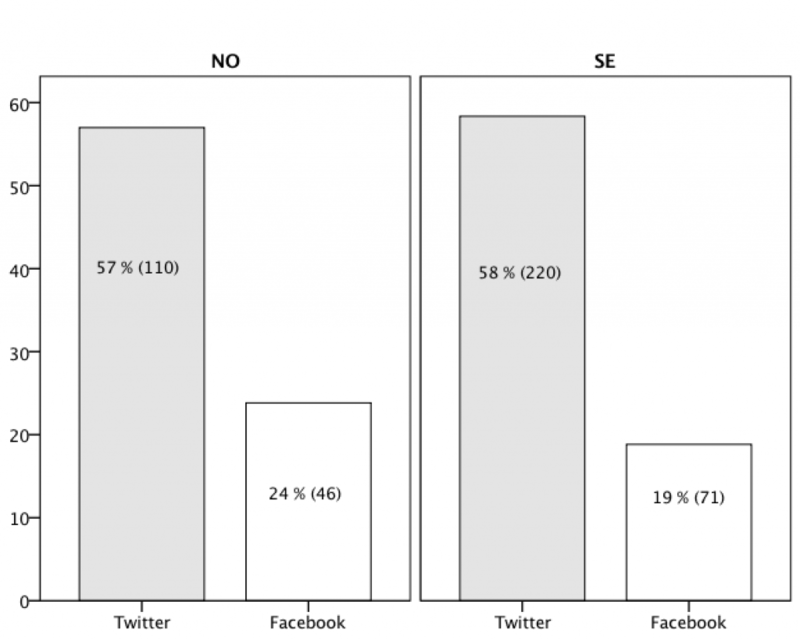 While Norwegian politicians have apparently adopted Facebook Pages to a slightly higher degree compared to their Swedish colleagues (twenty-four percent of Norwegian politicians use Facebook pages, compared to nineteen percent in Sweden), the differential when looking at Twitter is minimal (fifty-seven percent for Norway, fifty-eight for Sweden). The results presented here indicate that Twitter adoption rates were slightly higher than the Facebook counterparts. As Twitter use in the two case countries is often reported at rather low levels, the popularity of Facebook among the general populace becomes relatively sizeable. Our results here indicate that politicians are generally more present and more active on the former of these two, suggesting a potential online communicative mismatch between those electing and those elected. While the demographics of social media use can vary considerably in different contexts, use of Twitter in the Scandinavian countries has mostly been associated with elite, urban, media-savvy groups. In sum, then, if politicians wish to engage more clearly with everyday voters, they might be well served to look beyond Twitter for their social media activities. Of course, merely looking at whether a politician has an account on Twitter or Facebook or not does not take us very far in understanding the social media practices of elected officials – we also need to take their activity into account. This will be dealt in part II, coming up in a couple of days. Stay tuned!